Before I started writing what would become the final rendition of book 1 of the Sword of Dragons, the story began with a map. At first all I did was draw in the lines for the continents, and then I started picking where cities and land features would be…and as I marked down the cities, I began to formulate the countries, and their back stories. And thus, conflict was born. Four kingdoms, two at each other’s throats, with the other two supporting one or the other. Every couple of generations, a new war would start. When the kingdoms briefly united against the common foe, Klaralin, many wondered if peace would finally reign upon his defeat. But it was less than a century before Tal and Falind were at each other’s throats again, with Erien and Saran supporting each respectively. These recurring conflicts, in comparison to the war against Klaralin, became known as the Lesser Wars. But…why has conflict always broken out between Tal and Falind? Why are these two countries destined to squabble century after century? And will the peace that has come between them after book 1 last? By the time book 1 takes place, Tal and Falind have had periodic wars for over five thousand years. No one remembers the reason behind the first conflict. Somewhere in one of the sanctuaries of the Order of the Ages, there is a history book that tells of the first war, but even the greatest scholars have not seen nor read this book in millennia. What often sparks the Lesser Wars now are land disputes. Every time a new mine or other resource is discovered somewhere along the border, or every time a Warrior patrol from one kingdom strays into the other, it becomes the impetus for a new war. One thing is for certain, the Warriors’ Guild has been at the head of almost every conflict (almost.) When Cardin Kataar learns of this, it is one of the many reasons he begins to have second thoughts about joining the Warriors. Is he right? Are the Warriors the reason for the continual cycle of the Lesser Wars? Can the cycle be broken? But this begs the question…at this point, does the original reason even matter? If someone were to find this book and discover the original reason, could they point to this and say “See? This reason is no longer valid. Why are we still fighting?” Or would the book give them more reason to fight? Or, going back to the original question…would it even matter? As we’ve seen in the real world, “yesterday’s enemies can be today’s allies; today’s allies can be tomorrow’s enemies.” Today the United States and Britain are close allies. 250 years ago, we were enemies. No one cares about those old grievances so much anymore. So in all reality, no, a grievance five thousand years ago really has no play on the current conflicts. At worst, if someone from the time of the current book series were to learn of the original reason, they might use it as an excuse to continue war. Currently I have no plans of ever revealing in the book series why the original conflict began. But the original reason is a matter of sovereignty, stretching back to the era of Archos and Talus themselves. As the first kingdom, Tal, grew larger, it became more and more difficult to maintain the breadth of the Kingdom. Saran and Falind were both formed around the same time as one another, named after their first sovereigns. The leader of Tal at the time did not care for this outright revolt. These lands were under his rule. So he declared war. And Tal lost that first war, and was forced to concede Saran and Falind’s independence. But Tal didn’t forget, and never forgave. Fortunate for Saran, their capitol was formed at the end of a labyrinth of valleys in a vast land of mesas, and was nestled against the sea, and so was easily protected. Tal, realizing that they could never hope to take Sharenth, let them be, and when they had built up enough strength, marched upon only Falind. Saran, unwilling to let Tal have their way with an independent nation, attacked Tal’s forces. So the cycle began. The seeds of hatred between Tal and Falind were formed, and the customary alliance between Falind and Saran was born. Tal never conquered Falind, though they came close many times. As the original reasons were forgotten, there even came a point when Falind had designs on conquering Tal, putting to rest the Lesser Wars once and for all. I hope you all enjoyed this glimpse into the history of Halarite and the four kingdoms! If you enjoyed this, let me know and I’ll delve even deeper into Halarite’s history as time goes on! Onto the blog we go – are the best stories and characters born from emotion? The thought occurred to me late last year when I was proofreading all of my books just prior to release. As I read through them successively and rapidly, I discovered that the most recent story, The Orc War Campaigns, felt better written and more engaging as a story. And I wondered why. There’s probably many reasons, not the least of which is, it’s my latest, so all of the lessons I’d learned up to that point were ingrained into telling the story. But also…I wrote the characters out of real emotion. I know I’ve talked about it before, so I don’t intend to get into details, but as I wrote Amaya’s story and her struggle to move on from an emotionally abusive relationship, I used it as a way to explore my own attempt to do the same. And in using my own emotions and fusing them into the story, I was able to better connect with her character, as well as Zerek’s and Arkad’s. What resulted was a writing style that felt more relaxed, more intuitive. The writing flowed, and despite being 3rd person, it felt like the story was more from their perspective rather than an objective 3rd person describing the events. I’m also happy to have learned that others feel the same about The Orc War Campaigns. In fact, despite being the longest book I’ve written so far, folks have read through the entire book in one sitting! That tells me I definitely did something right. So now the question is, can I take this idea and write the next book in the series the same way? Can I connect more with Cardin and Kailar and write in a way that makes it easier for the reader to connect with them? The answer, of course, is yes. But it also meant I had to go back through the chapters I wrote last year and the year before and changing them…or in the case of Kailar, rewriting them from scratch. Actually, I’m glad to have had this revelation. I came to realize that my original plans for Kailar were far too passive in book 3, and that I needed to drastically change things. Originally she was going to be very passive, following Letan’s orders and only occasionally letting her temper take hold and spur her to more direct action. That’s not Kailar. It never was. Part of what makes her such an engaging character is that she is an antihero. She wants to do what’s right, but isn’t held back by the same moral constraints as Cardin is. She is much more aggressive. And now, after the events of Burning Skies, she has the power to back her aggressive and straightforward nature with direct action. And I have to say, I enjoy writing her a lot more this way! She felt two-dimensional before, this feels more natural for her. Another bonus to having taken a break from book 3 was that I came up with new ideas for book 3 as well as later books that I could foreshadow in book 3, especially for Cardin. His journey in book 3 starts out feeling like it’s the same as book 1 and 2, something comes up, an adventure, and he just goes along with it. The tragedies of book 3 were always planned, but they’ve become even more vital after a discussion I had with our friend (and wedding photographer) Danielle, about how she felt like Cardin was never really in any danger. His powers protected him, and always evolved to save him in a life-threatening situation. And it’s true, the Sword of Dragons makes Cardin very difficult to hurt. Everyone else, however…not so much. Worse still for him, being the Keeper of the Sword means that his actions never affect just him, or even just his friends. He also must contend with the new paradigm of Dark Magic, and what it means for him and his future. Book 3 will be a very personal journey for these two characters, as well as for Reis. More so than in Rise of the Forgotten or Burning Skies. All with the backdrop of an epic story unfolding! In the Sword of Dragons series, which is a series one might assume involves a lot of dragons, they seem to be largely absent at first. They’re talked about in legends, and the titular Sword was constructed by them to end the greatest civil war that the Universe has ever seen. Dragons are popular right now, or so I’ve been told and so my ads based on keyword searches has shown. Books about dragons are in demand. And I love dragons. 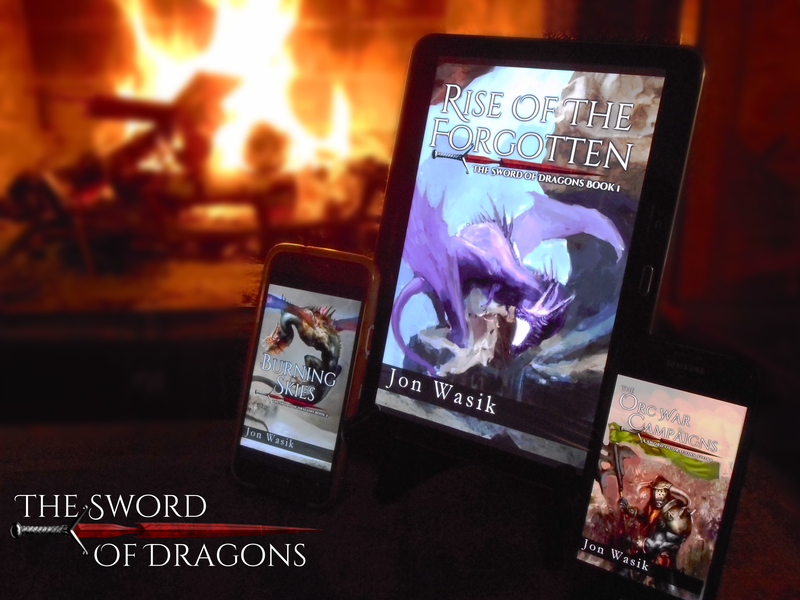 So why did I write the first couple books of Sword of Dragons with so few dragons? Honestly when I first started writing the series, that was not my intent, but as the story developed and I started from scratch in the late 2000’s, I knew exactly how I wanted to treat them. They were to be mystical, legendary. People whispered about them, revered them as the exemplars of good and just in the Universe. There were once tens of thousands, and they roamed the worlds and realms, exploring, caring for others, and keeping the Universe in order. The dragons once numbered in thousands, were powerful, and the epitome of good in the Universe. Perhaps the one and only people that were ‘pure good’ rather than gray. And then they were all but wiped out after one of their own fell and corrupted others, taking the extreme opposite of good. In a Universe where no object or power is actually inherently good or evil, dragons are the exception. And now they are a mystery. A legend. A whisper. Everyone holds them in awe. Meeting the first one, Avall, Cardin has an almost religious experience. And then he meets more good ones. Then book 2 happens, and he meets the original bad guy. Like Luke facing Vader for the first time. And Cardin, like Luke when he learns that Vader is his father, is terrified to realize that he has the same power as this ultimate villain. I didn’t realize it until this week, but I’ve come to realize how much my love of Star Wars and the Jedi has influenced the back story of the Sword of Dragons series. The Star Dragons, however, still number in the hundreds. So part of why there are so few is the Star Wars influence, but there’s a little more to it than that. And it really comes down to the fact that I love dragons, that they’ve captured my imagination all of my life. But there are so many good dragon books out there…so I felt like the series had to earn their presence. Justify their return to the struggle. And make it to where they remained something special and weren’t just common or average. When a dragon shows up in a scene, it is something special, something wondrous! And as time goes on, their role increases. Unlike Star Wars, it is only after books one and two that one of the “jedi” aka dragons comes to train Cardin. During this time period, in book 3, Cardin will go on a journey that will affect him spiritually, and will help prepare him for the devastating events to come. Book 3 – Return of the…Dragons? Throughout book 3, we’ll get to spend more time with the green dragon Endri, who sort of takes over the role that Dalin previously filled. Which of course will mean that Dalin will need to find his place in the grand scheme of things. Furthermore, early in book 3, we’ll get to see dozens of dragons, as they rally together to try to find Nuuldan and end the threat of the Dark Dragons once and for all. This also means we’ll get to learn more about the Star Dragons than ever before! Including the fact that they have not spawned young dragons since before the defeat of the Dark Dragons, and thus their numbers continue to dwindle rather than grow. Perhaps the most exciting scenes that I’m most looking forward to writing is when Cardin and his friends travel to the ancient Star Dragon home world, a place that seemingly none of the Star Dragons have visited in thousands upon thousands of years.